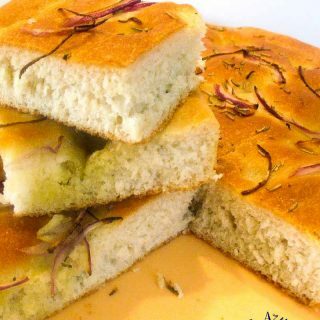 This homemade recipe of the classic Italian focaccia bread is an absolute treat with any meal or just on its own. 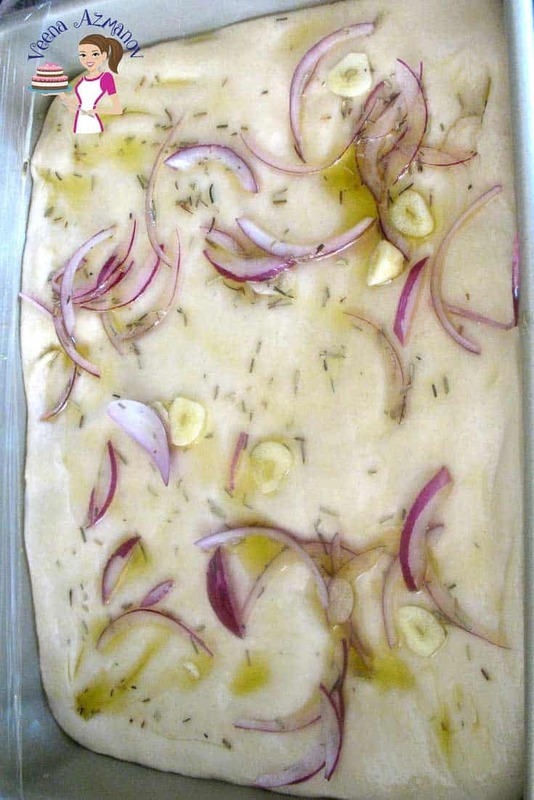 Baked with fragrant rosemary, sweet red onions, and pungent garlic. Soft light bread on the inside with a golden delicious olive oil infused crust on the outside. This Italian classic is as popular as pizza these days. I doubt there is anyone that does not know pizza and focaccia today. The dough is very similar but still not the same. 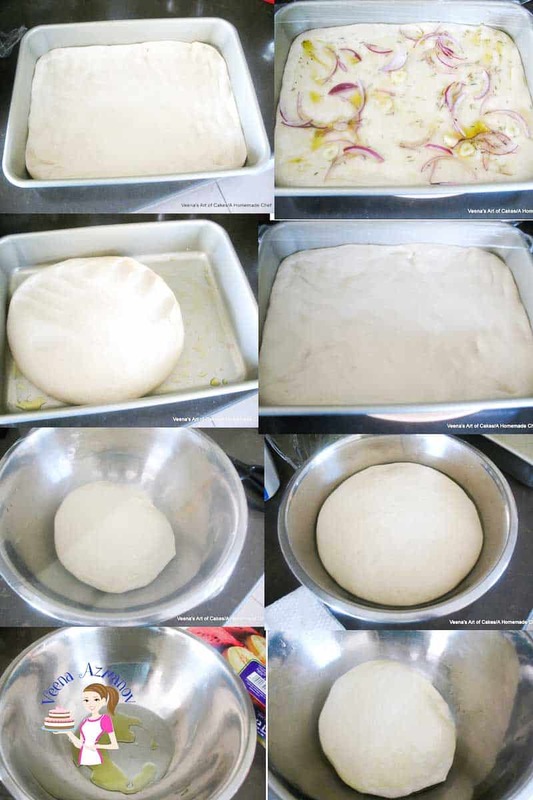 Often we make a focaccia pizza at home because the focaccia dough is more rich, infused with olive oil and herbs. My mom would say, One of the most prominent features of a focaccia is the oil wells you have on top of the bread. You make these with your fingers so the oil can seep in and infuse the bread with all its deliciousness. The olive oil on the top forms a nice delicate crust but seeps into the soft bread on the inside making it more chewy and juicy. 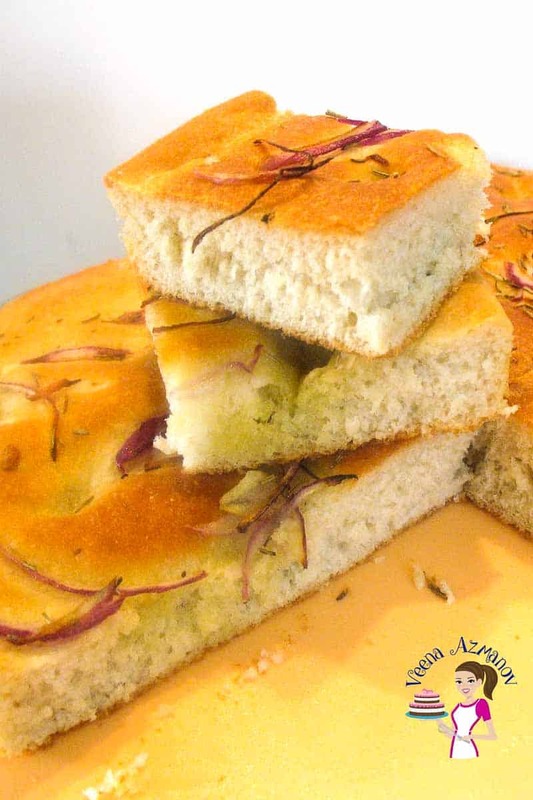 If you love bread, the focaccia is an absolute treat. You will enjoy it on its own. Often simple toppings like rosemary, red onion, and garlic are all it takes to add flavor. You can, of course, take it one step further and add some mozzarella and pepperoni too. Yup! You must try a good focaccia pizza. I absolutely love focaccia bread. We usually enjoy it with pasta. The tomato sauce left from the pasta on the plate taste even more delicious with a good bread doesn’t it? The leftovers make amazing focaccia sandwiches. My kids’ favorite is tomato and cheese focaccia sandwich. Can you see that texture? That’s is a good focaccia bread!! My mom would be so proud. All-purpose flour – AP flour works great with this dough. 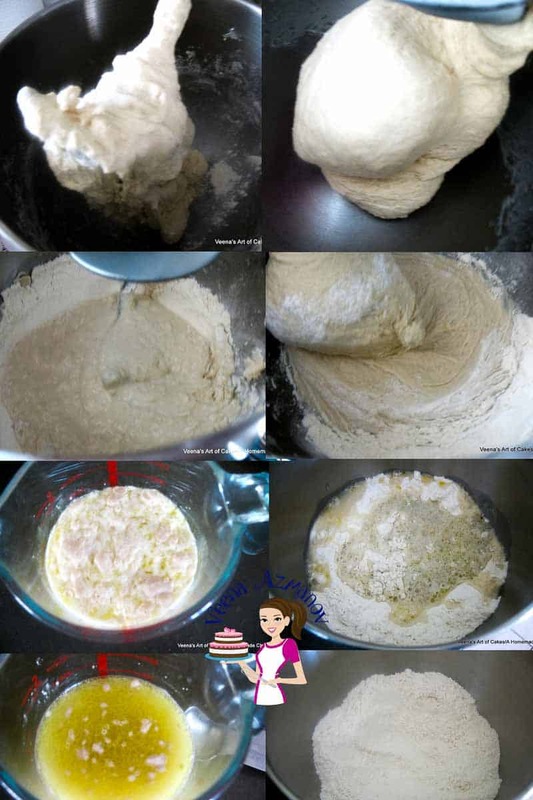 You do not need any special flour. You can save the bread flour for your pizza. 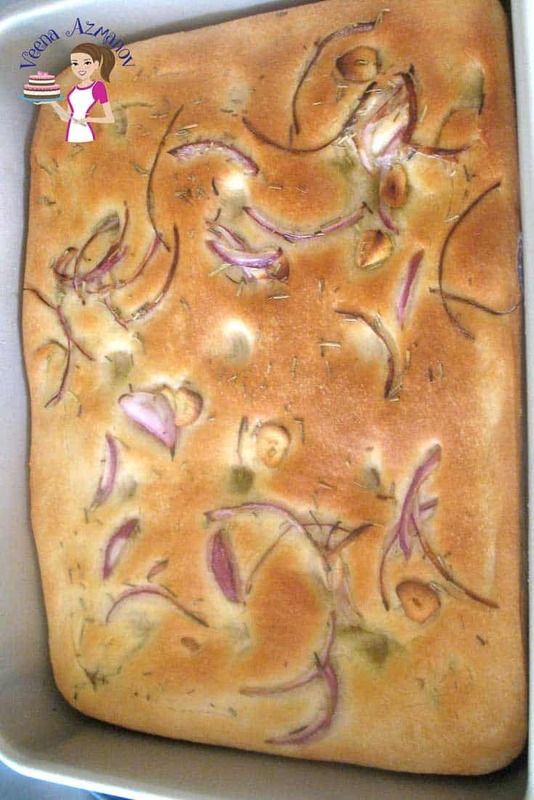 Olive oil – A good olive oil is like a good wine and can make a huge difference to focaccia bread. It does not just enhance the flavor but also the texture and the crust. Sugar or honey – I often use sugar but honey works just as well. I have tried both. 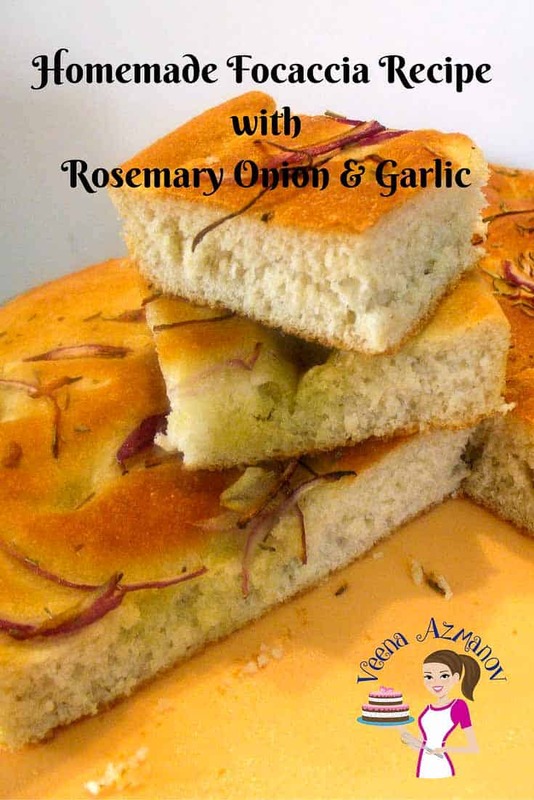 Toppings – I love using rosemary, red onion for its sweetness and garlic for its pungent flavor. In fact, I love to soak the garlic in the olive oil before so it does not burn. I have tried many different versions – rosemary, onions, mushrooms, cheese, chilly flakes,… the list goes on. Go with your taste buds. Onions – If you choose to use onions I highly recommend using the red onions. They are sweeter and really add a nice sweet caramelize sweetness to the focaccia. Warm the water to 110 F (just slightly warm). Add yeast, sugar, salt, and olive oil. Let rest at room temperature for 5 minutes. The yeast mixture will get foamy. Place 4 cups of flour in a mixer bowl with a dough attachment. Combine the flour and yeast on medium-low speed scraping the sides of the bowl until all the dry flour is incorporated. Continue to knead on medium speed for 2 to 3 minutes adding only enough flour to make a smooth, soft, elastic dough. The dough should be soft and slightly sticky but not too wet. Transfer to an oiled bowl, coat the dough with a little olive oil and cover with damp cloth or cling wrap. Until double in volume about an hour or more. Once the dough is double in size. Spread olive oil in a square or sheet pan. I’m using my 9 x 13 sheet pan. Spread the dough with your fingertips into the pan. Trying to ensure it spreads evenly. If the dough is not stretching let it rest for 10 minutes then spread again. Cover with damp cloth or cling wrap and rest for about 15 minutes. 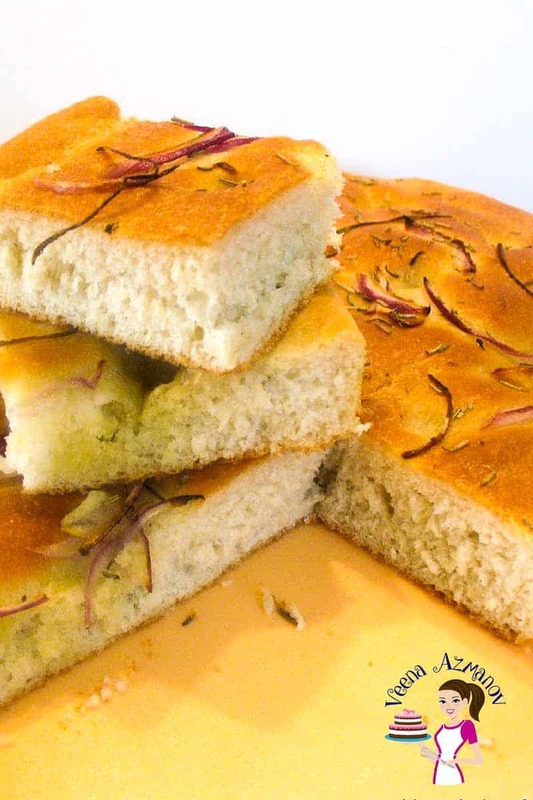 Make holes on the top of the focaccia with your fingers. Spread some olive oil and sprinkle rosemary, garlic, and onions over the surface. Let rest another 10 minutes while the oven is preheating. Bake in a preheated oven for about 20 minutes. or until golden brown on the top. Then remove and cut into squares to serve warm with more olive oil on the side. Spread olive oil in a square or sheet pan. I'm using my 9 x 13 sheet pan. 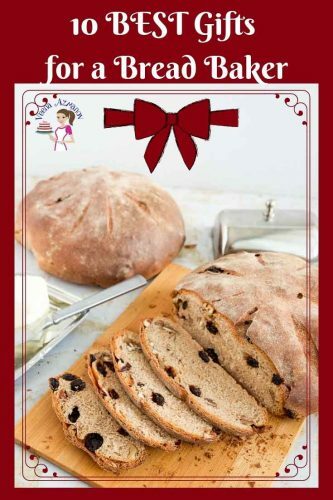 10 Best Gifts for Bread Bakers. 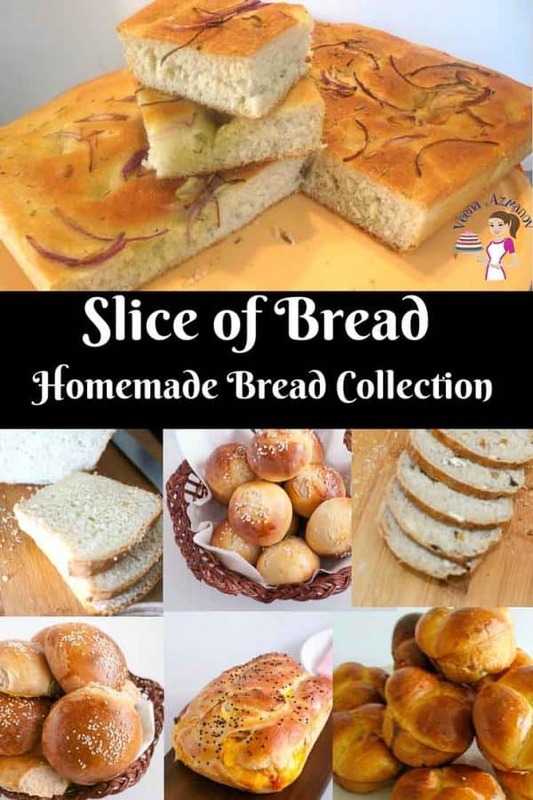 Feel free to check out my – Slice of Bread – Homemade Bread Collection or see my Recipe Index for a collection of all recipes on this blog. If we r using instant yeast…how much do we use in the Above receipe.? Is it possible to work the dough by hand only? Yes, claire. You can make it in a bowl… I later started showing the recipes in a bowl. so look at some of my recent bread recipes. I show how to make in a bowl. Follow that process but with this recipe.. This was my first successful attempt at making foccacia. Thanks for taking so many pictures. Really helps to see the pictures rather than taking a recipe from the internet. I kept this post open and used the pictures as a reference. I like your blog and just saw your cake blog. Wow… you are so talented. For fresh yeast you probably need about 25 grams… ! I hope this helps. You are amazing. For the first time I actually made bread. I found this blog through your cake blog. I saw how detialed the recipe was and decided to try it. I can honestly say my focaccia was better than the sore bought one. I think I will try more form this blog too.